A group of local denimheads have taken jean-making into their own hands. The beauty of raw selvedge denim jeans—and the reason they’ve become the subject of a worldwide clothing cult—is all about the story. Denim enthusiasts look deeper into the details of clothes and the creation narratives behind them. 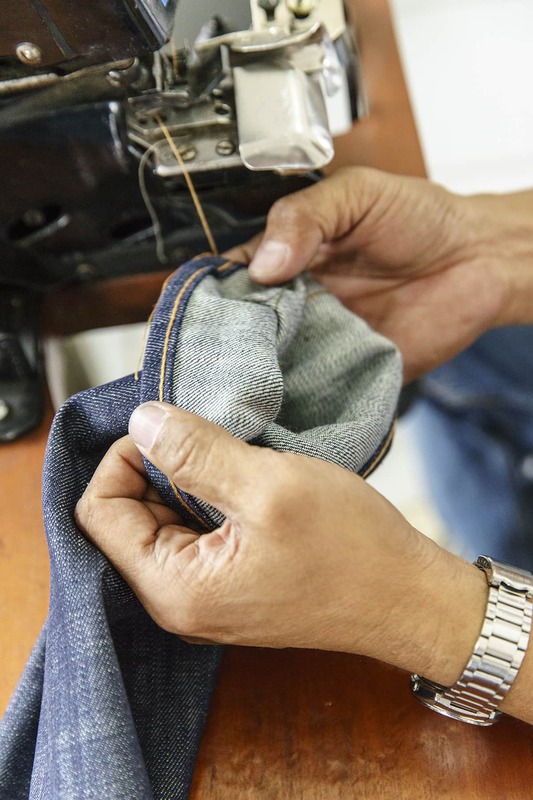 Where most people see the basics: fit, cut, color, and the little white strips of fabric on the sides of the jean cuffs; enthusiasts ask other questions. Where were these jeans made? Using what fabric mix, sourced from which mills—and with Zimbabwean cotton, or Turkish cotton? Then eventually, after they’ve been worn, the story becomes: How did you wash them, and after how many months of wear? What did you do and where have you been in those jeans? Until recently, these narratives haven’t really involved the Philippines. We’ve seen a rise in denim enthusiasm locally, for sure. More and more Filipino men have been buying selvedge denim, beach-soaking their raw jeans and comparing fades with other like-minded style nerds. But only Japan and the U.S. have been big players in terms of actually producing raw selvedge denim jeans—alongside Canada, France, and Sweden, to a lesser extent; and a few even smaller independent brands from countries like the Netherlands, Indonesia, and Malaysia. It wasn’t until Leon Denim came along that the Philippines joined these ranks. As the first and only Filipino-made selvedge denim lifestyle brand, Leon Denim makes jeans here, using choice Japanese raw selvedge denim. And like the Japanese brands that have been around for decades, Leon creates jeans and clothes using traditional methods, in the style of mid-century Americana clothing—think Levi’s 501s, work jackets, field coats, military garb, Red Wing boots, handmade goods. It’s an aesthetic that’s associated with the culture of selvedge denim, and now, the Philippines has our own piece of it. 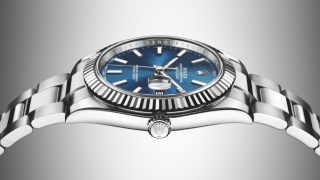 "When you hold our products, you know there’s value, it was made properly, following heritage processes and machines. They’re faithful reproductions of all these traditions." They also grew up on a healthy diet of men’s magazines, through which they developed a taste for style and an eye for good clothes. Then when Jake started working in IT and traveling around Asia, he found himself accumulating his own collection of magazines. “At one point, parang napuno ‘yung kwarto ko ng magazines. That’s how I learned about fit, how clothes should drape. And I’ve always been curious about how things are put together. I study these things with an engineering mindset.” Albert even specifically recalls learning about how tapered jeans with boots can make you look taller, from an issue of Details which featured Tom Cruise and Ryan Gosling as examples. Eventually, their passion would push them to start making their own jeans, just for themselves at first, without intentions of becoming a retail brand. 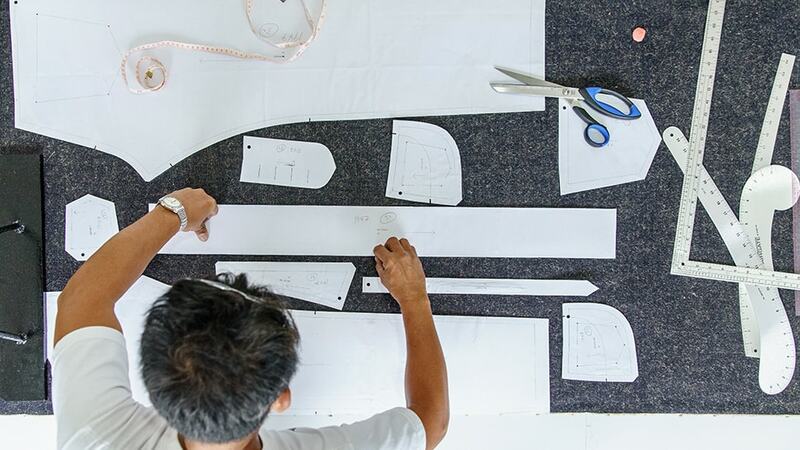 Jake recalls importing short ends—a few yards of scrap fabric from selvedge denim factories—through a Californian website, hoping to make the kind of jeans that they couldn’t easily find here in the Philippines. But at that point, passion was all it was. “We knew what we wanted, but we didn’t know how to execute,” says Jake. Then they found a tailor who used to work for Levi’s back when some of the now-coveted, pre-1971 “Big E” Levi’s jeans were made here in the Philippines. They coached the tailor into making jeans for them using their imported fabric, slowly getting the very specific results that they wanted through trial and error, updating the patterns and techniques as they went along, and sometimes even using fabric from Divisoria to test. Iver was also a member of online forums for denim enthusiasts, which was part of how the team was able to research the production process. “We say that we make it in the same way that these guys in Japan make them, and we’re not fibbing when we say that. There are actually people in the Philippines who can do it." 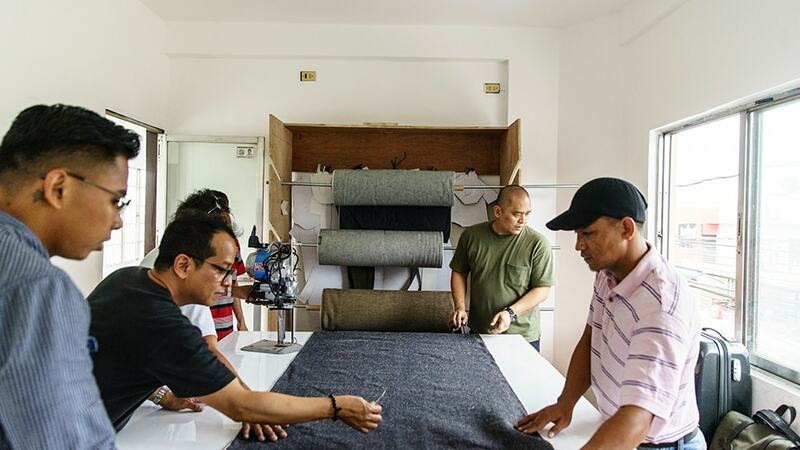 By the time that they had gotten a hang of it, the natural next step was to make it a brand, as a way of growing denim culture here in the Philippines. “You want other people to wear what you like,” says Albert. “It contributes to your culture, the community, sharing it.” And so it was with an earnest love for good clothes—specifically, for jeans—that lit the spark for Leon Denim, which kicked off around December 2014. “We ended up looking at machines from all over the place,” recalls Jake. “From old factories that closed down, from old tailors who were letting go of stuff because they’ve closed shop.” It took a great deal of resourcefulness—especially on the part of Iver, who Jake says is their sourcing guy—to put it all together, but eventually, the boys started selling their jeans too. In keeping with the heritage aspect of of denim culture, Leon’s jeans come in very traditional fits: mostly wide and regular, some slightly slimmer, but never anything in the vicinity of skinny. Their jeans also have the specialized rivets, buttons, and stitching that are characteristic of the old-school American blue jeans that were distilled into an artform in Japan, among brands like Momotaro, Fullcount, and Studio D’Artisan. 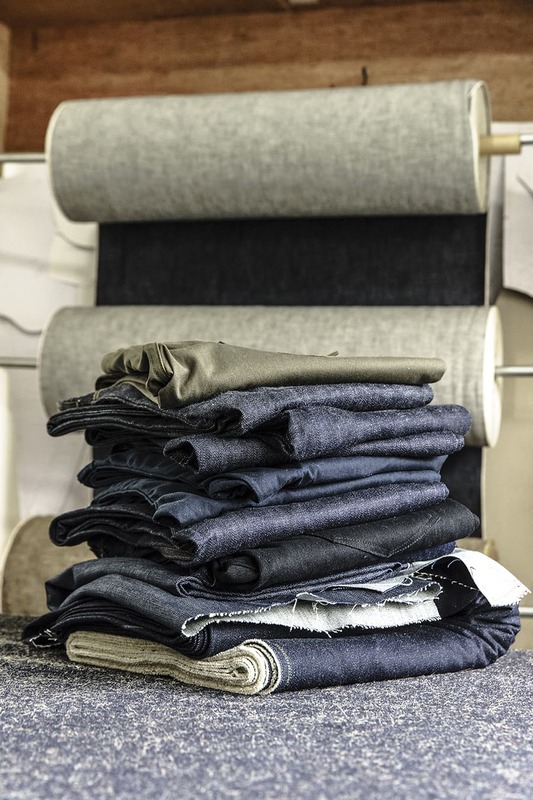 In fact, Leon even sources denim from the same mills as these Japanese brands, but gets most of their fabric from Collect Mills, which also makes fabric for well-known Japanese selvedge denim brands like Japan Blue and Momotaro. Looking and feeling their jeans today prove that these guys have come a long way from their start as hobbyists. 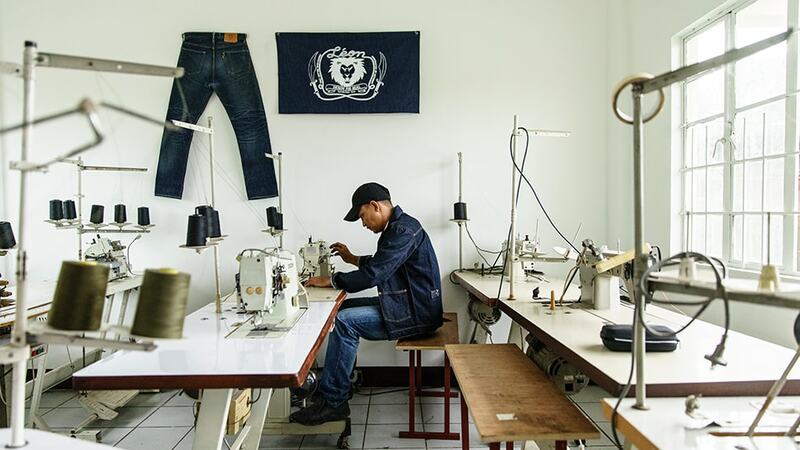 They’ve learned to make the real deal—the kind of jeans that, five or six years ago, you wouldn’t have been able to find here in the Philippines, much less imagine that they were made here. Through the sheer power of denim obsession, Leon has taken the meticulous craft of raw selvedge jeans and propped it up in a small workshop in Cavite. Today, Leon Denim’s jeans have been recognized internationally, by denim blog Heddels and in the global raw denim subreddit. They’ve carved out a space for the Philippines in the niche of denim enthusiasts, and now, they’re making far more than just straight-up raw selvedge denim jeans. Leon has gone on to create hairy hibiscus denim jeans (which are as crazy and cool as you’d think), duck canvas chinos, mechanic’s hats, Type-1 and Type-2 denim jackets, leather belts, and shawl-collared navy jackets, among others—all made in the old-fashioned, time-honored, quality-first way.